Braves By The Numbers: Who the Heck is: Alberto Callaspo? I'm starting a new feature weekly where I pick a player from the Braves roster, and I tell you a little bit more about his career. Because honestly, chances are you don't know anything about these guys before they got here. So allow me to tell you a little bit more about our first candidate for "Who the Heck is?" Mr. Alberto Callaspo! Alberto has ten years in the majors, and he started his major league debut with the Arizona Diamondbacks in 2006. The Braves picked up Callaspo at the end of 2014 for a one year deal, I'm guessing to shore up their bench in the infield, and perhaps let him compete for a 2B slot. Little did they know that Jace Peterson would emerge in spring training to steal the hearts of Braves Country and have the ladies swooning like he was made out of man-candy. According to all accounts in spring training, Callaspo showed up covered in bacon drippings. Now a little weight gain doesn't really hurt baseball players that much since Babe Ruth was a complete hog and he managed to hit 700+ homers. However, in today's game that's less power focused and more about a speed concept, I'm pretty sure you could have clocked Alberto with a Twinkee the Kid Sun Dial. Yet here we are in the regular season, and Callaspo has been pulling his weight (hur hur hur). In 3 games he's 4/7 with a run and an RBI. He took over the opening day 3B slot from Chris Johnson, a move that did not please the normally completely level-headed CJ 2.0 (heavy sarcasm). Despite the slow start in spring, Callaspo has thrived in one series. Whether or not he will continue to produce over 162 game is up for debate. However, if he can provide a platoon and put some pressure on Chris Johnson to shut up and play hard, that's a good thing. Callaspo's best year in the majors came in 2009 when he was on the Royals. He hit over .300 for batting average with an .813 OPS. That year he had 11 homers and 73 RBIs, both career highs. He's never fully achieved those results in any of the subsequent years since then. Mostly, I'd consider him to be an average as grits players with a .700 OPS for his career, no speed, sub-par power, and below average defensive ability and range. He's an aging player who seems to have found a second gear for the early part of 2015. Still he's also had a ton of experience on different clubs, as he's played for 5 teams now in his career. I'm not expecting much out of Callaspo other than to provide some platoon depth and the occasional RBI. The odds are that his numbers will even out, and he will return to his normal form over the next couple of months, which is decent at the plate at best. Still, the upside for Callaspo should be better than his 2014 year with Oakland, where he was a complete disaster at the plate. He hit for a .223/.290/.290 slash line, which put him only a couple dozen points ahead of BJ Upton in OPS. That's not good company to keep. The true test for Callaspo will be how he deals with pinch hitting opportunities, because that's where he's likely to get some scoring chances. Lifetime as a PH he only has a .229 average. That would have to improve some for him to provide some value to the club. But then again, most of these players the Braves traded for are attempting to overcome a bad 2014, or a sub-par aspect of their game, or an injury, or a personal issue in their past. The roster is full weird back-stories like a comic book. Just like Callaspo apparently getting arrested for domestic violence in 2007 but later dropped, or when he was sued for paternity support in 2011 but it turned out the child wasn't his. 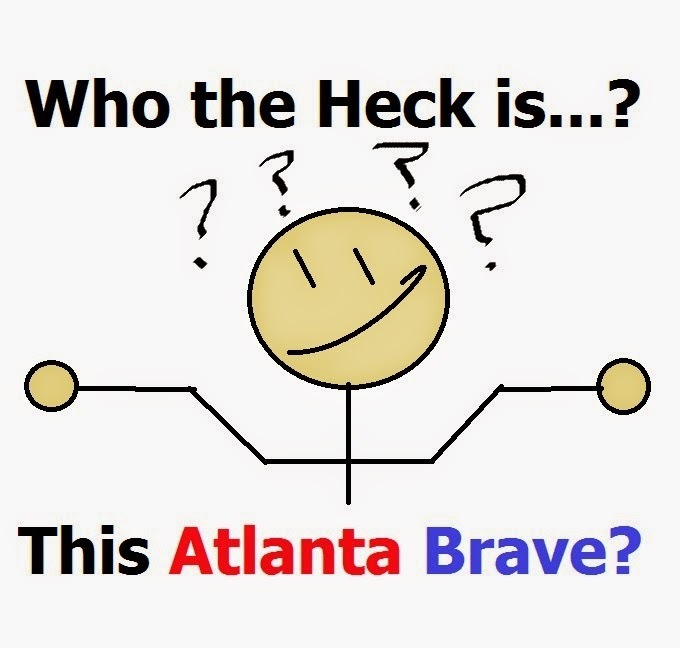 "Who the Heck Is" columns will shine a light for better or worse on this Island of Misfit Toys that is the Braves lineup in 2015. Hopefully you'll learn something along the way, and maybe get a better idea about how these guys showed up at camp one day. Either way, we're all going to be happy they put the players names on the backs of the jerseys this season. You can't tell the players without a program.